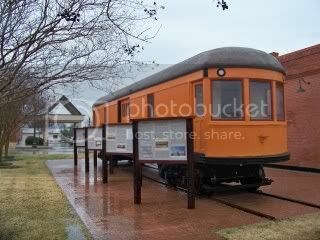 The first interurban express car in Texas now resides at the Heritage Visitors Center in Burleson. Built by the G.C. Kuhlman Car Company of Cleveland, Ohio in 1902 for the Northern Texas Traction Company, the express motor ran the rails between Fort Worth and Dallas as Car 12 until the NTTC christened a new line south from Fort Worth to Cleburne in 1912. Like many of its era, Car 12 transitioned to the new line with a new number, 330. The Interurban Express and Baggage lines announce the opening of the Cleburne division of interurban service, the extension being over the line of the Fort Worth Southern Traction Company. It is stated that adequate station and trackage facilities have been provided at Everman, Burleson, Joshua and complete wagon service will be maintained at Cleburne. Express trains will leave Dallas daily at 8:20 a.m., 11:35 a.m., 2:20 p.m., 6:20 p.m. and 9:20 p.m. and connect with trains leaving Fort Worth at 6:25 a.m., 12:25 p.m. and 5:25 p.m.
Messenger Kelley and Motorman Henry of the interurban express, seeing a large bird on the track at 7 o'clock tonight stopped the car and captured what bird experts say is a silver pheasant. Some say the bird might have escaped from the zoo at Dallas. In April 1921, the Dallas Morning News announced through freight service from Dallas to Cleburne, with a car leaving Dallas for Cleburne at 5 p.m. each evening. Passenger service between Fort Worth and Cleburne came to an end on April 30, 1931 due to the prevalence of good roads, automobiles, competition from bus lines, and a worsening economy. Car 330 returned to the Fort Worth - Dallas Line, where it continued hauling freight until that line's demise in December 1934. Like dozens of others from North Texas, Car 330 was sold into private hands. 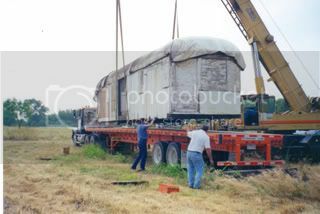 The Westmorelands purchased it and a number of other freight cars and moved them to their ranch near Cresson. 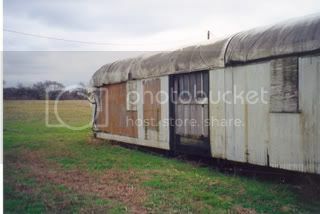 The old interurban express cars were used to store feed and implements. 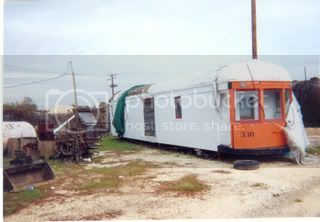 As the original express motor for the Northern Texas Traction Company, Car 330 is the oldest car of its kind in North Texas. Four freight cars were patterned after it, two of which remain on the Westmoreland place. Originally, Car 330 had two doors on each side and an arched "turtleback" roof remiscient of passenger cars of the era. 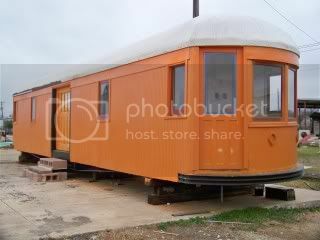 Once painted a bright Pullman Green, 330 and other freight cars were repainted a vivid orange after a series of accidents, some of which were fatal. 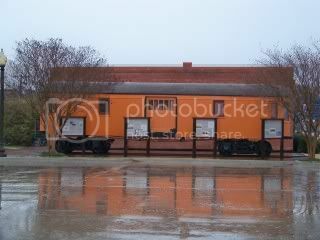 Car 330 came to Burleson through the efforts of Dr. John J. Myers, author of CERA Bulletin 121 Texas Electric Railway and Michael H. Beard, whose dream was to restore the former Interurban Drugstore at 124 West Ellison Street in Burleson to its original grandeur. Myers purchased the car from the Westmorelands, and in 2000 it arrived in Burleson as a hoped-for centerpiece of a memorial to a different time in the once small town. Mike Beard led an often one-man effort to restore the car. 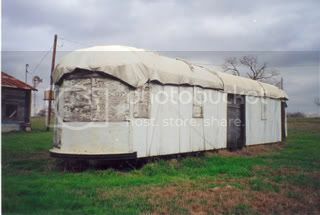 After disagreements with the Burleson Heritage Foundation and the City of Burleson over volunteers, funding, and other issues, Beard withdrew from the restoration project. From 2002 until 2006, the car deteriorated under the volatile Texas weather. The exterior walls, roof, and floor succumbed to rot while metal bracings rusted. Upon joining the Burleson Heritage Foundation in 2005, I began looking for ways to jump-start the project. With help from my mother Michelle Griffith, also a volunteer with the BHF, we located groups restoring and operating similar traction vehicles, the nearest being North Texas Historic Transportation, the group responsible for restoring Crimson Limited Passenger Cars 25 and 411 in Fort Worth. At the same time, I met Leon Sapp, another volunteer at the Burleson Heritage Foundation who had recently retired after a long career in transportation. After numerous discussions with Sapp, Beard, and meetings with North Texas Historic Transportation volunteers, a plan of action took shape. Leon Sapp assumed leadership over the project and a crew of volunteers with NTHT and BHF set to work in July 2006. Remnants of the original roof were removed from the freight area and a new roof took shape in late 2006 and into 2007. Exterior and interior walls were ripped out, leaving the original studs and a few metal beams and rods. Soon, even the floor was taken up. Due to a lack of fundraising and material limitations, the car has not been restored to operating specifications. Yet Sapp and his crew have been industrious in their use of present-day materials to achieve the appearance of period craftsmanship. Although there have been a few bumps in the road, the crew has done a remarkable job under less than ideal circumstances. According to the Burleson Heritage Foundation, the car will resemble its appearance during the final run through Burleson on April 30, 1931. A period controller, marker lights, cooler, bell, front lamp, and other detail components similar to the originals have been donated to or purchased by the Foundation. Originally expected to take six months, the project is now anticipated to be finished in 2010, more than a decade after Michael H. Beard and Dr. John J. Myers first brought the car to the attention of Burleson. Once complete, Express Motor 330 will be open for tours alongside the Loyless Interurban Drugstore, 124 W Ellison Street, in Downtown Burleson. Finally, she's got a roof over her head!